Mini concrete batch mix plant by Atlas is the preferred choice of customers who want a reliable and small batching plant for places that require to work in extreme small space. This batch mixers can be pulled and taken to places by any suitable vehicle, they do not require any concrete foundation as just flat surface is enough. Mini concrete mixers are easy to erect and use. With simple knowledge and basic operating skills one can use this machine to get product concrete for years. Maintenance points are considered as priority. All the lubrication points are well covered by a single lever that helps in lubricating all the moving parts of the batch mixer. It is available in both electric and diesel engine models. RM 800 electric : 8-9 m3/hr. RM 1050 electric : 12-13 m3/hr. RM 800 diesel : 8-9 m3/hr. Atlas mini concrete batch mix plants are best for small sites. They are preferred by small and big contractors who have to undertake jobs in remote eares or areas that have very less space to work. This machine can be pulled by any suitable vehicle and can be taken places. It comes with three bins and separate weighing for cement, additive, sand, and water. The mixer is reversible drum mixer. Control panel is PLC touch screen type with printing facility. A printer can be attached if required. 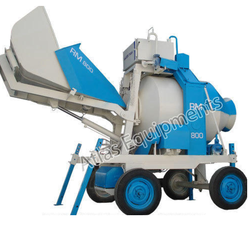 Mini concrete batch mixer is also available with a diesel engine. It has all the important features of the machine that is offered with electric engine yet it has the flexibility of a diesel engine. It means that the machine can be taken to places and made to work even where there is no supply of electricity. A strong diesel engine powers the machine with ease. 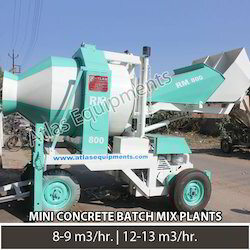 Looking for Mini Concrete Batch Mix Plant ?